State Rep. Scott Conklin, D-Rush Township, said that he will introduce legislation for the regulation of kratom, an herbal drug that is currently sold over the counter and has increasingly been linked to overdose deaths. 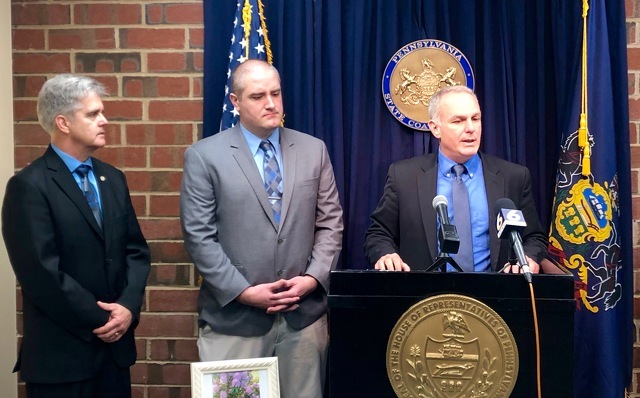 Conklin was joined at a press conference on Friday by Centre County District Attorney Bernie Cantorna, who brought the issue to Conklin’s attention after a State College woman died of a kratom overdose in November. "It poses a great risk and it's something we can address," Cantorna said. "It is not safe in an unregulated manner. Our legislature needs to take action and take action quickly." Kratom is derived from leaves of a southeast Asian tropical tree and its active compound mitragynine is addictive and interacts with the brain's opioid receptors. In recent years it has been sold in a variety of unregulated forms, including pills, powders, liquids and waxes, at convenience stores, head shops and online. It is sold as having alleged benefits for pain relief, mitigating opioid addiction and other medical conditions. Both the Food and Drug Administration and Drug Enforcement Agency have in the past two years issued warnings about using it, as it can pose a number of health risks ranging from psychosis to seizures to death. Conklin said his pending legislation would add kratom to the list of schedule 1 controlled substances in Pennsylvania. “Deaths due to this substance are on the rise nationally, because those addicted to opioids are using it to either increase the effects of those drugs, or people are using it as a treatment for withdrawal,” Conklin said. “There is no reliable evidence to support kratom’s use to treat opioid addiction or for any other health conditions, including depression, diabetes, obesity and high blood pressure." A study by the Centers for Disease Control released on Thursday found that over an 18-month period between 2016 an 2017, kratom was a contributing cause in 91 overdose deaths in 27 states and was present in 61 other fatal drug overdoses. Cantorna said that in Pennsylvania in 2017, 27 multi-drug overdose deaths have involved kratom. Several counties in southeastern Pennsylvania have reported overdose deaths attributed solely to kratom. Centre County joined them late last year. On Nov. 3, 2018, 34-year-old Meagan Martain purchased two $50 bottles of kratom pills at Jamaica Junction in State College, Cantorna said. Two days later she was found by State College police, dead from an overdose. Cantorna said he recently asked the store to stop selling kratom products and that to his knowledge it is the only retailer in State College selling the products. "She thought she was taking an herbal supplement that would help her and made her feel good," Cantorna said. "She had been the victim of a car crash and had some struggles with prescription opioids. She was on the other side of that and in the last year of her life, she was putting her past behind her and she was going forward. At the same time people were selling her a product that was going to kill her." Martain's parents were in attendance at the press conference, but did not speak. Conklin said that his legislation is aimed at protecting people who are seeking relief from chronic pain and other conditions and are just hoping for something to restore their quality of life. Consumers, he said, are purchasing kratom products that do not have any indication of the concentration of active ingredients, list no recommended dosage and may contain other unknown ingredients. Conklin said mitragynine concentration can vary wildly from pill to pill. "We want to make sure they’re getting what they’re asking for, exactly what they believe will help," Conklin said. "The only way you’re going to get that is to make sure it’s done in a safe environment where it’s regulated properly." Cantorna said the current ability for anyone to manufacture and sell kratom products is untenable for the people taking them. "They’re taking medical advice from someone who’s not trained to do so and then they’re dying," Cantorna said. Maryanne Dunkel, of Tyrone, came to the press conference to urge Conklin not to advocate for a total ban on kratom. She said that after suffering from daily "unrelenting" pain and going through numerous medications and therapies for fibromyalgia, she began using pure leaf kratom as an herbal supplement and found relief, saying that she is not addicted to it and does not get a high from it. She said that she supported regulations and getting "adulterated" products off the market. Cantorna said if it is helpful to people, it should be regulated in the same way other medications are. "There’s room for intelligent people to figure out what, where and how," Cantorna said. "There isn’t room for the current sale of capsules that is unregulated and people are uninformed. "If kratom and the active ingredient is useful to individuals, then it should be studied, regulated and used as such, as opposed to being sold in a shop and place where it has no right to be." According to the Mayo Clinic, studies have found kratom's "side effects and safety problems more than offset any potential benefits." Conklin said his goal is for experts to guide how kratom might be regulated. "The first step is to make sure there aren’t more Meagans of the world who believe they are taking something safe," he said. "We not only have to make sure it’s regulated properly, but we have to make sure it’s safe. All that goes into effect as soon as we get the legislation done." 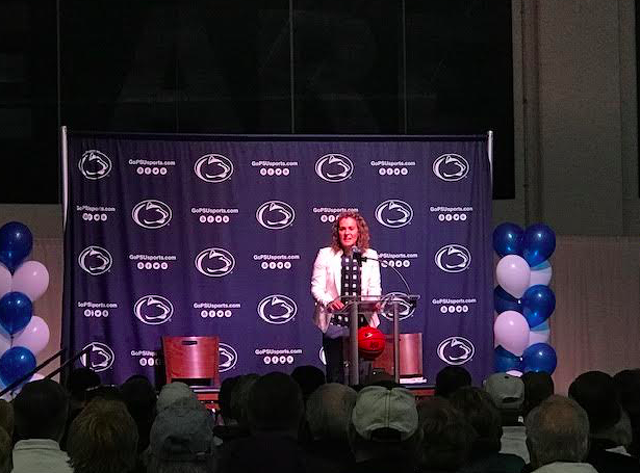 Penn State women's basketball officially introduced Carolyn Kieger as its newest head coach on Friday to a Bryce Jordan center practice facility full of Lady Lion fans, hopeful for a new and successful chapter in the program's history. "We will develop deep relationships here," Kieger said to the crowd. "We will develop tremendous leaders and in turn win championships because of that process."